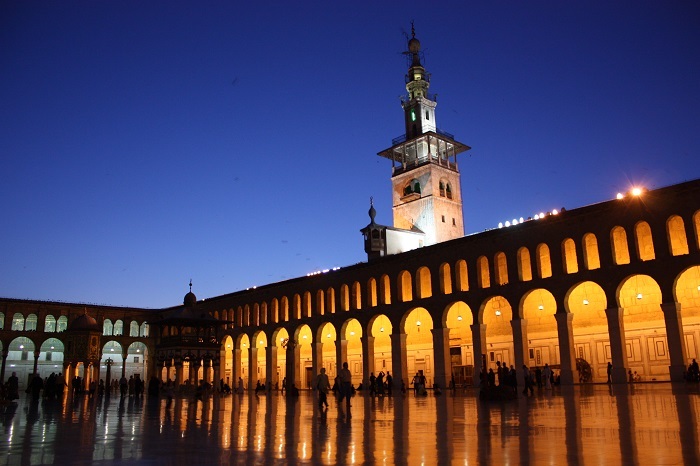 The Grand Mosque of Damascus, known more commonly as the Umayyad Mosque, is one of the largest, oldest and holiest mosques in the world. 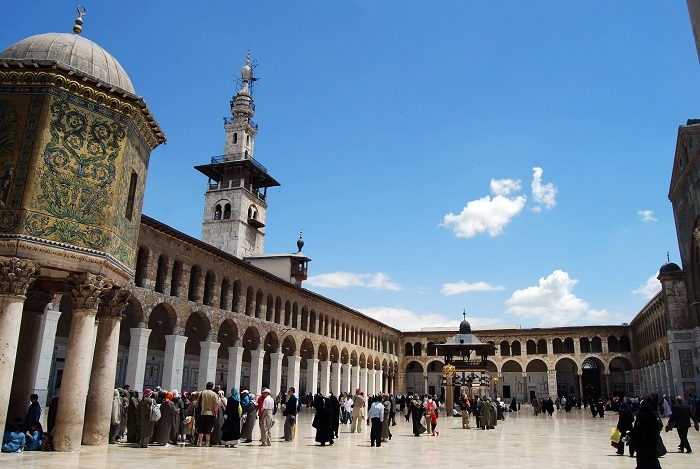 It is located in the old city of Damascus, and it is considered by some Muslims to be the fourth-holiest place in Islam. 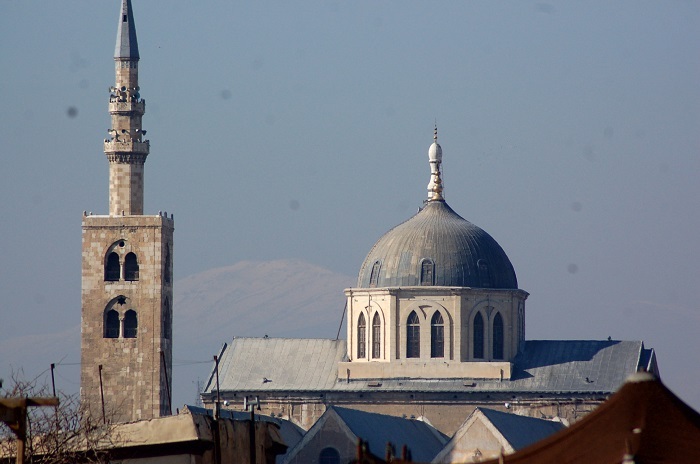 After the Arab conquest of Damascus in 634, the mosque was built on the site of a Christian basilica dedicated to John the Baptist (Yahya), honored as a prophet by Christians and Muslims alike. 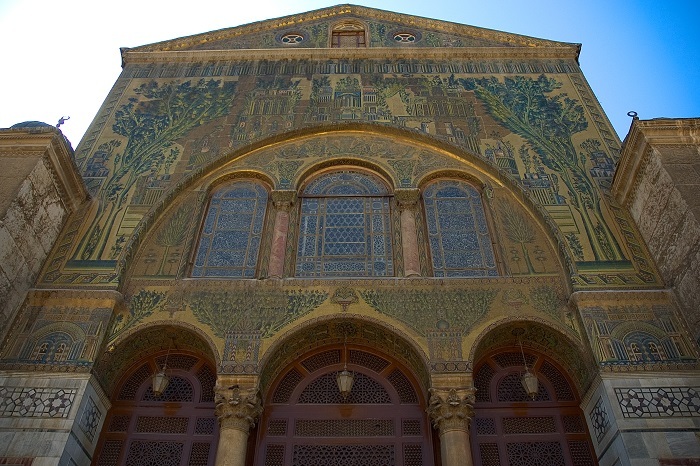 A legend dating to the 6th century holds that the building contains the head of John the Baptist. 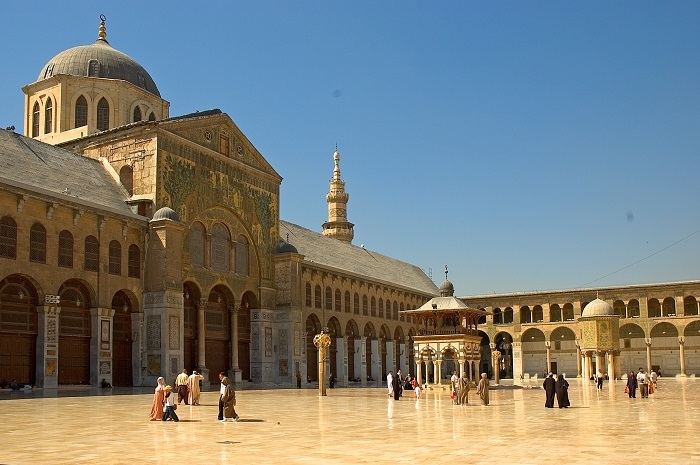 The mosque is also believed by Muslims to be the place where Jesus (Isa) will return at the End of Days. 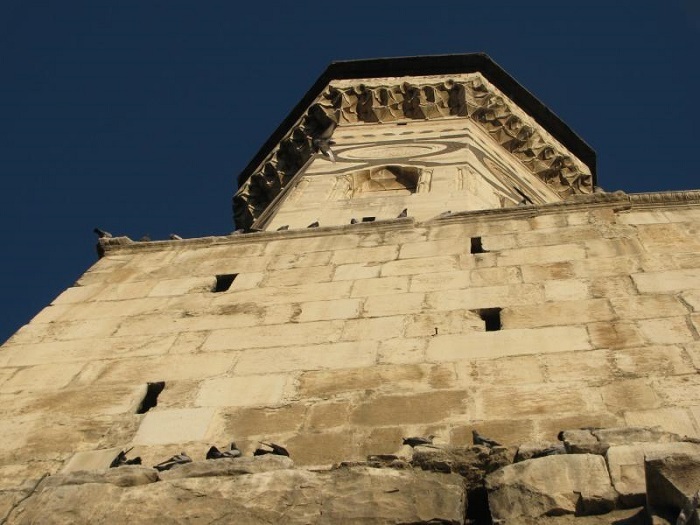 In addition, the tomb of Saladin stands in a small garden adjoining the north wall of the mosque. 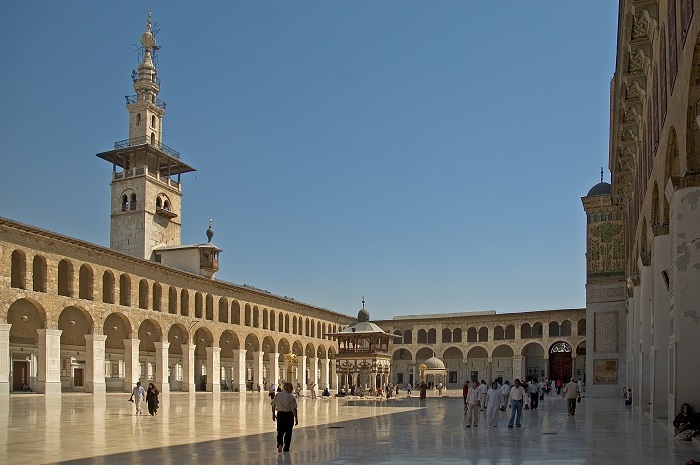 The ground plan of the Umayyad Mosque is rectangle in shape and measures 97 meters (318 feet) by 156 meters (512 feet). 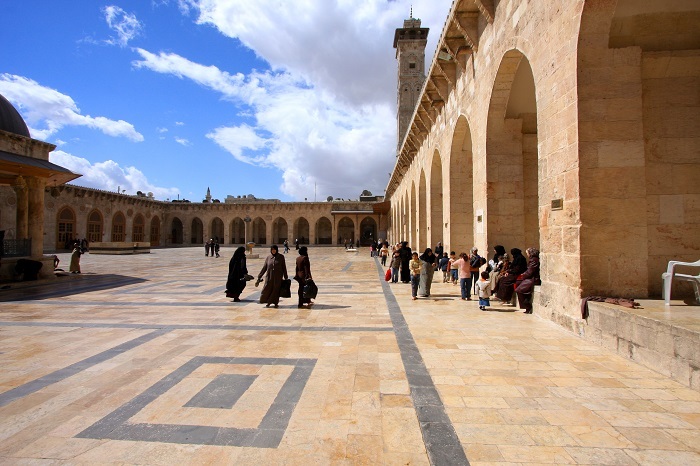 A large courtyard occupies the northern part of the mosque complex, while the haram (“sanctuary”) covers the southern part. 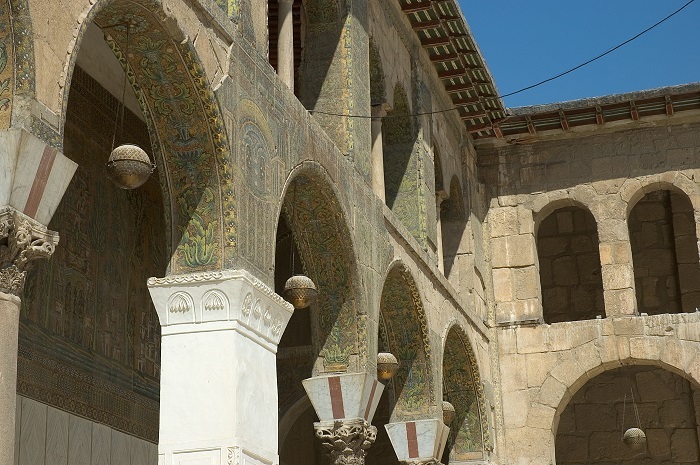 The courtyard is enclosed by four exterior walls. 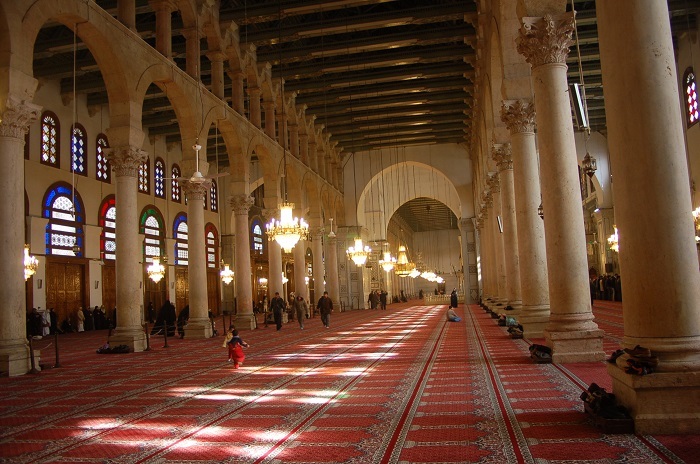 Three arcades make up the interior space of the sanctuary. 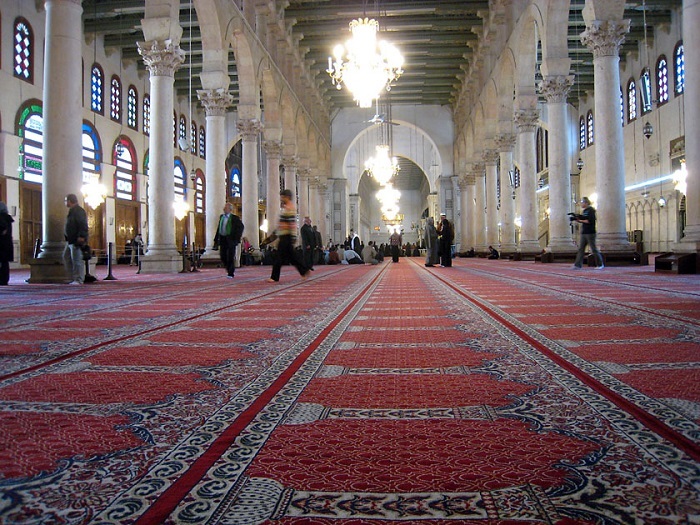 They are parallel to the direction of prayer which is towards Mecca in modern-day Saudi Arabia. 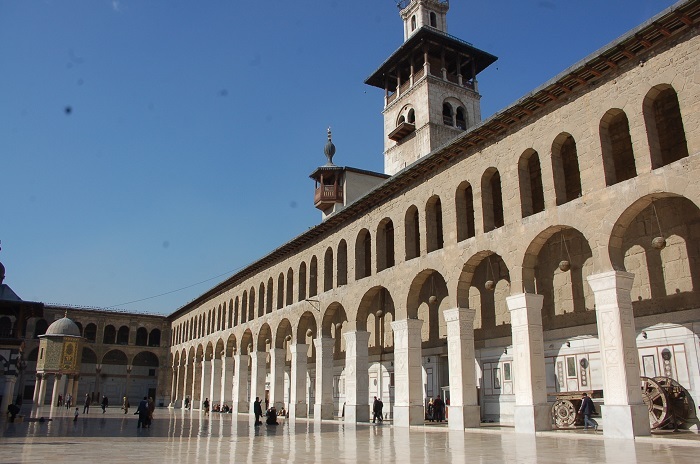 The arcades are supported by two rows of stone Corinthian columns. 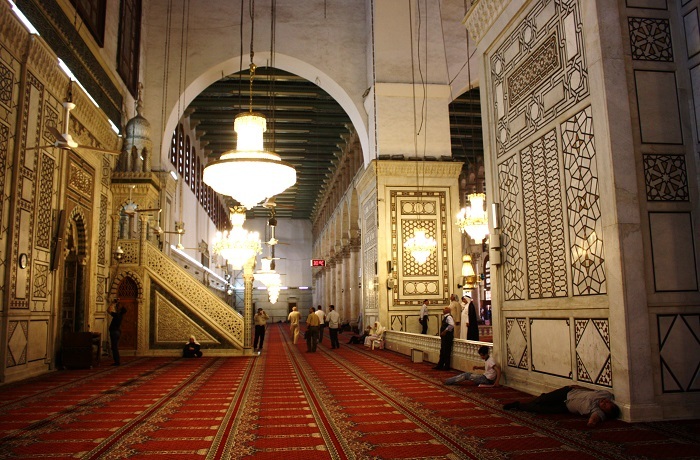 Each of the arcades contain two levels. 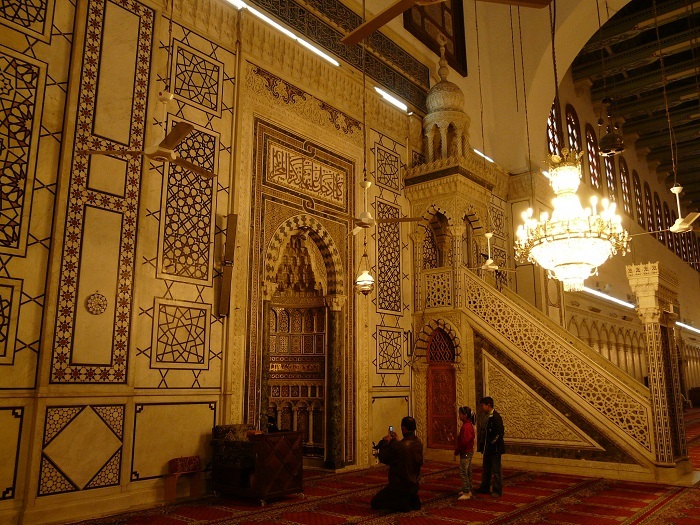 Four mihrabs line the sanctuary’s rear wall, the main one being the Great Mihrab which is located roughly at the center of the wall. 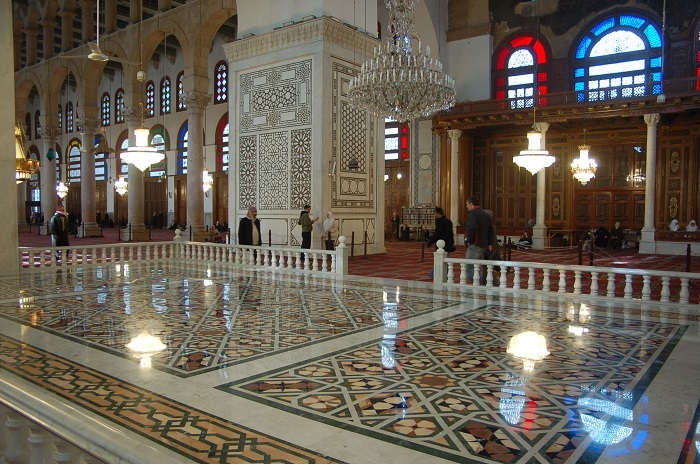 The Mihrab of the Companions of the Prophet (named after the Sahaba) is situated in the eastern half. 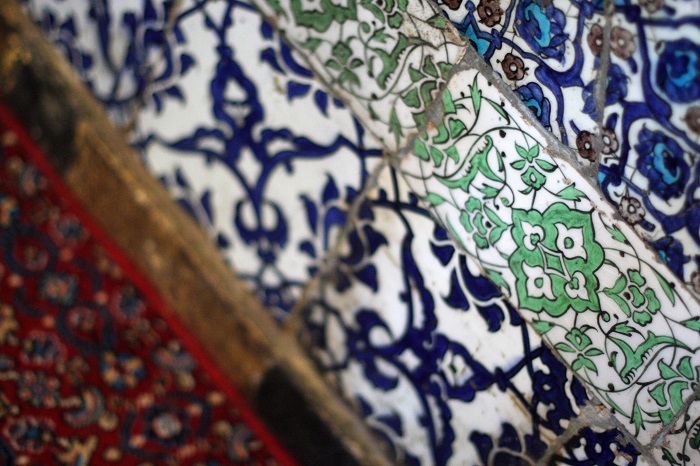 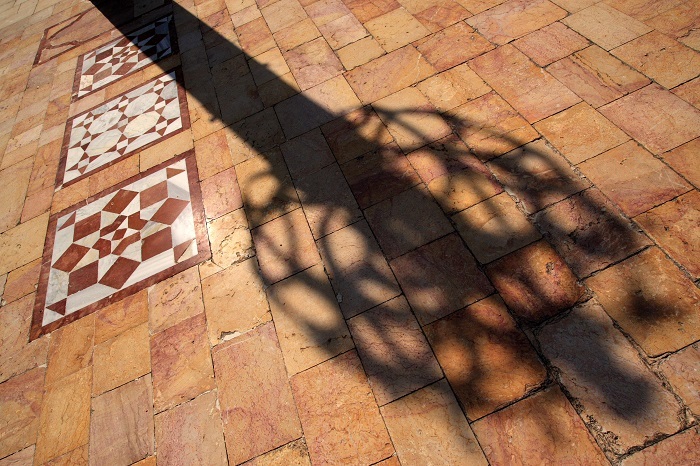 According to ancient Muslim engineer Musa ibn Shakir, the latter mihrab was built during the mosque’s initial construction and it became the third niche-formed mihrab in Islam’s history. 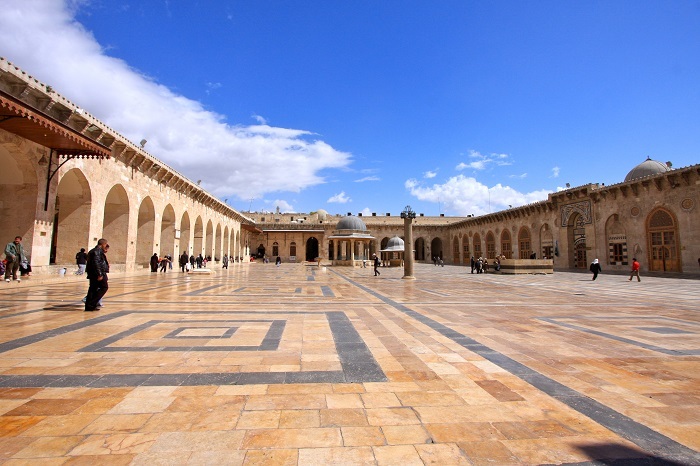 The largest dome of the mosque is known as the “Dome of the Eagle” (Qubbat an-Nisr) and located atop the center of the prayer hall. 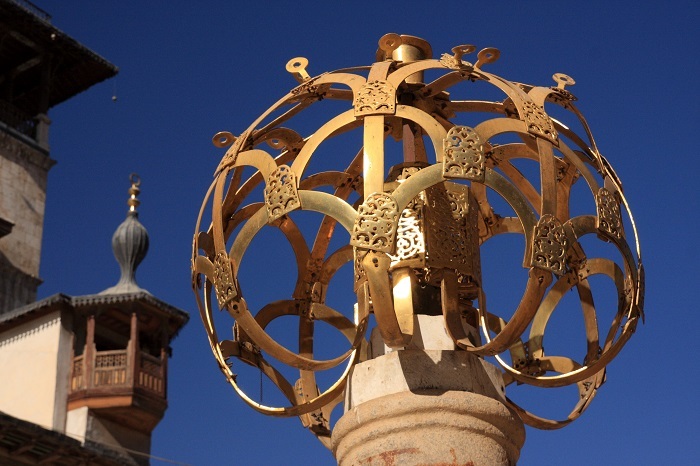 The original wooden dome was replaced by one built of stone following the 1893 fire. 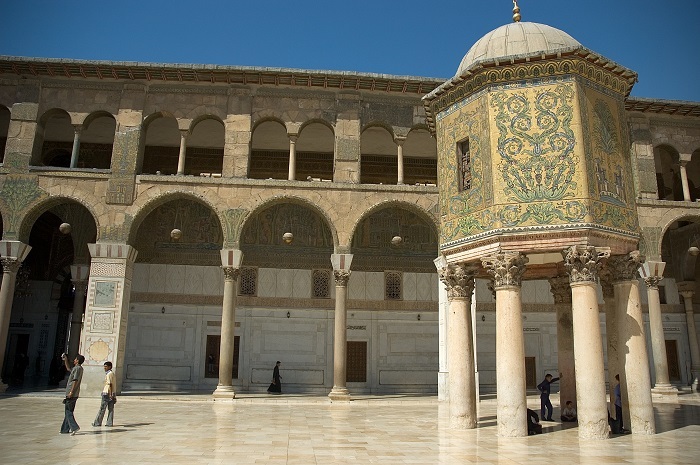 It receives its name because it is thought to resemble an eagle, with the dome itself being the eagle’s head while the eastern and western flanks of the prayer hall represent the wings. 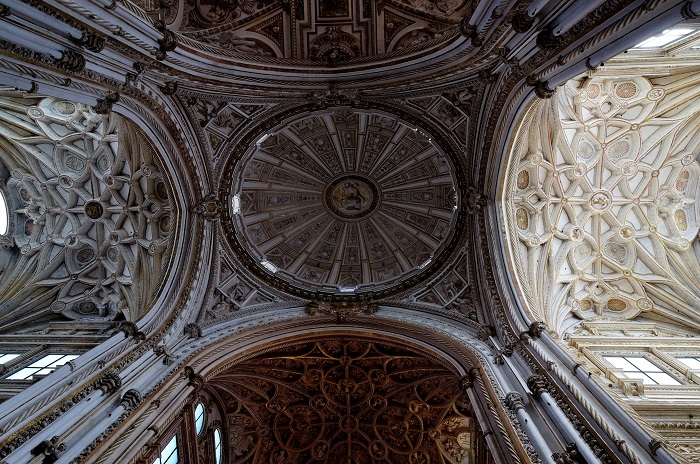 With a height of 36 meters (118 feet), the dome rests on an octagonal substructure with two arched windows on each of its sides. 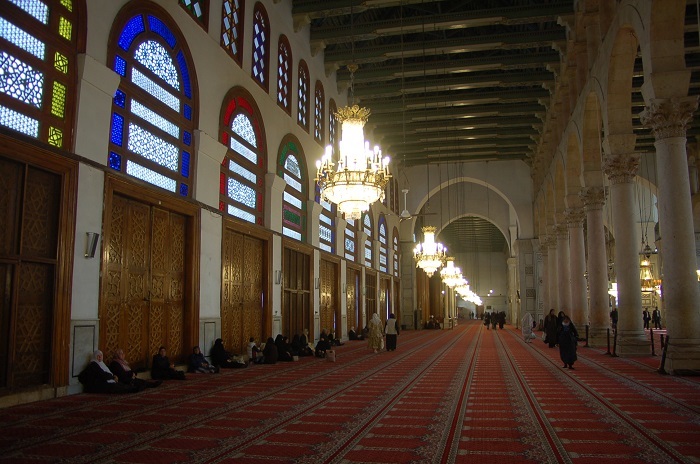 It is supported by the central interior arcade and has openings along its parameter. 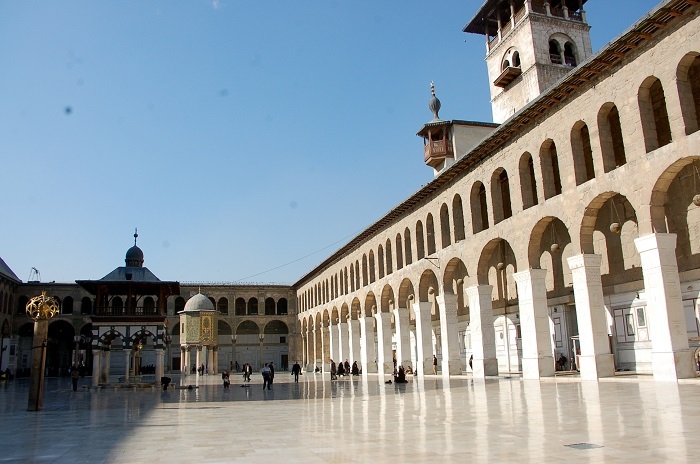 Within the Umayyad Mosque complex are three minarets. 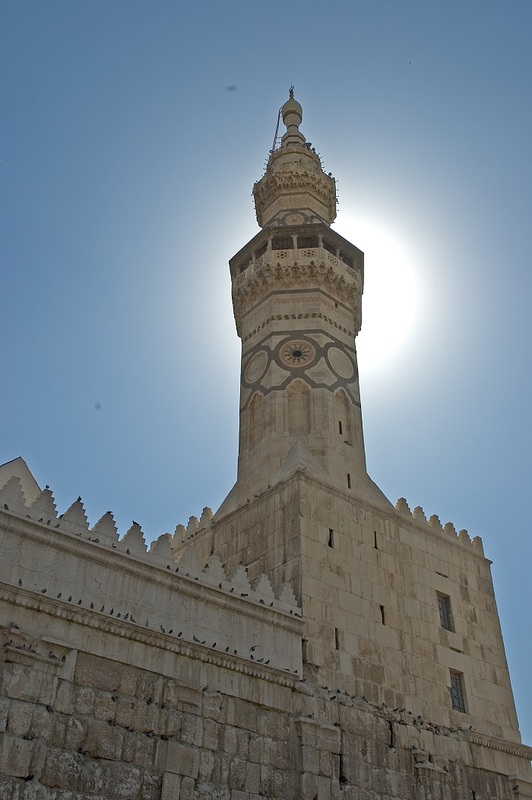 The Minaret of the Bride (Madhanat al-Arus) was the first one built and is located on the mosque’s northern wall. 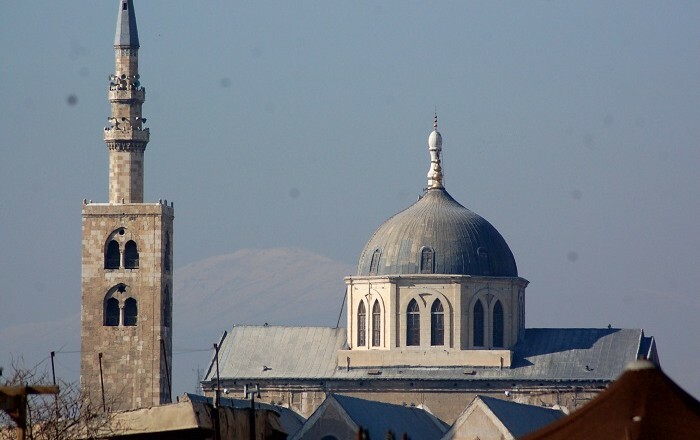 The Minaret of Jesus (Madhanat Isa), located on the southeast corner of the mosque complex, is around 77 meters (253 feet) in height and the tallest of the three minarets. 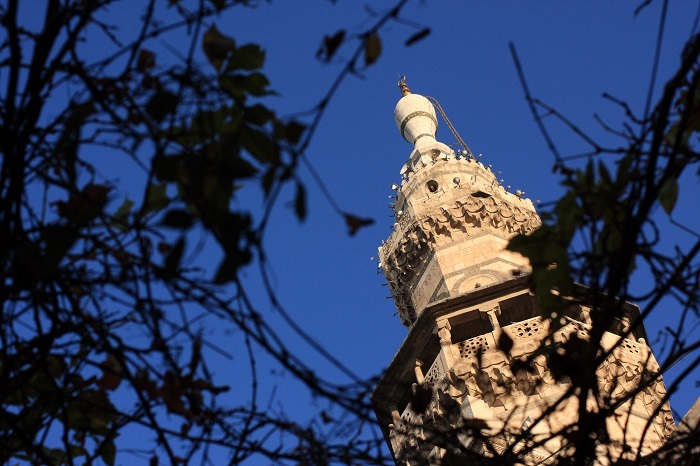 The Western Minaret (Madhanat al-Gharbiyya) is also known as the “Minaret of Qaitbay” as it was built by Mamluk sultan Qaitbay in 1488. 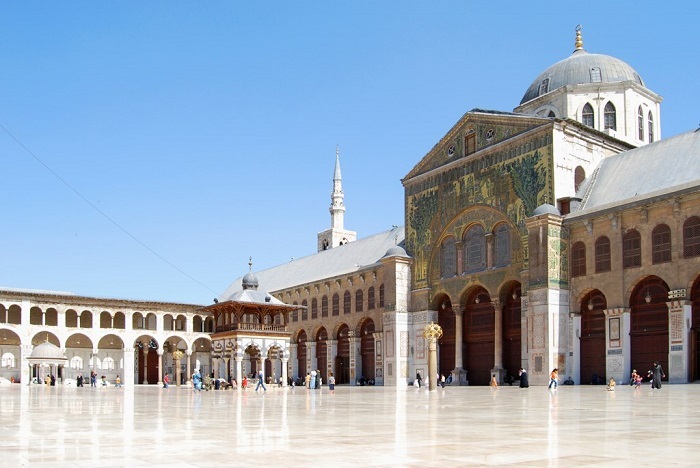 The Umayyad Mosque is one of the few early mosques in the world to have maintained the same general structure and architectural features since its initial construction in the early 8th century and its Umayyad character has not been significantly altered.